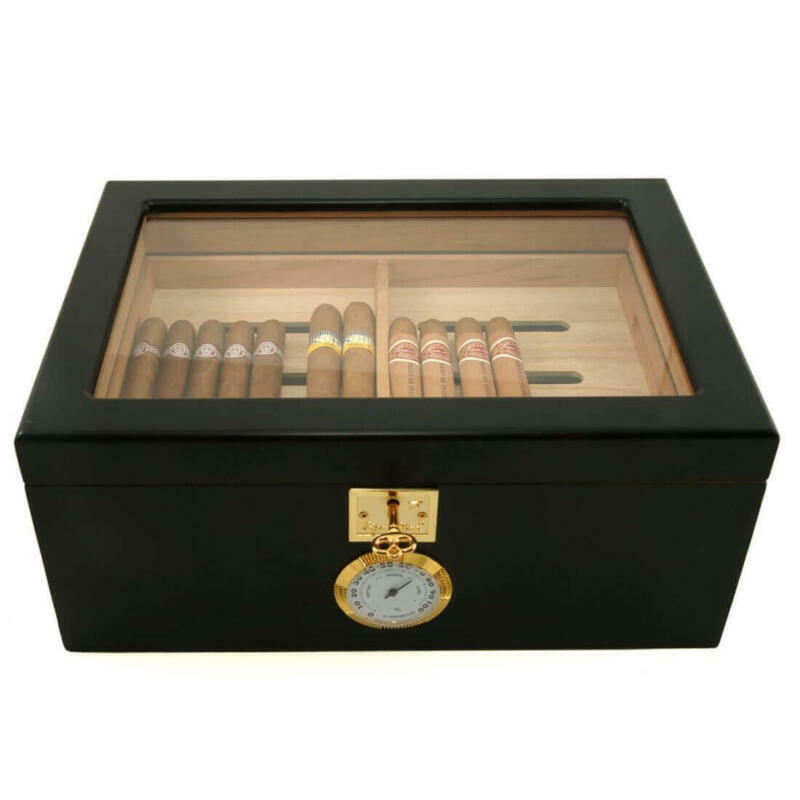 Black Showcase Cigar humidor with Spanish cedar inlay inside Spanish cedar air flow rack, a beautiful matte finish on the outside. 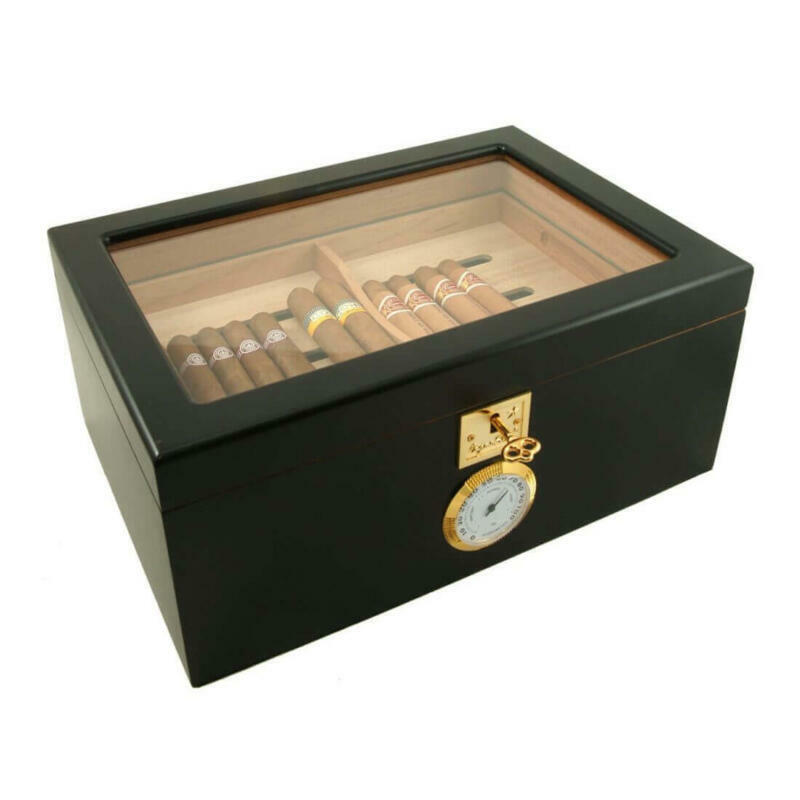 Solid Black in color and is accented with a see through glass lid to showcase your cigars. 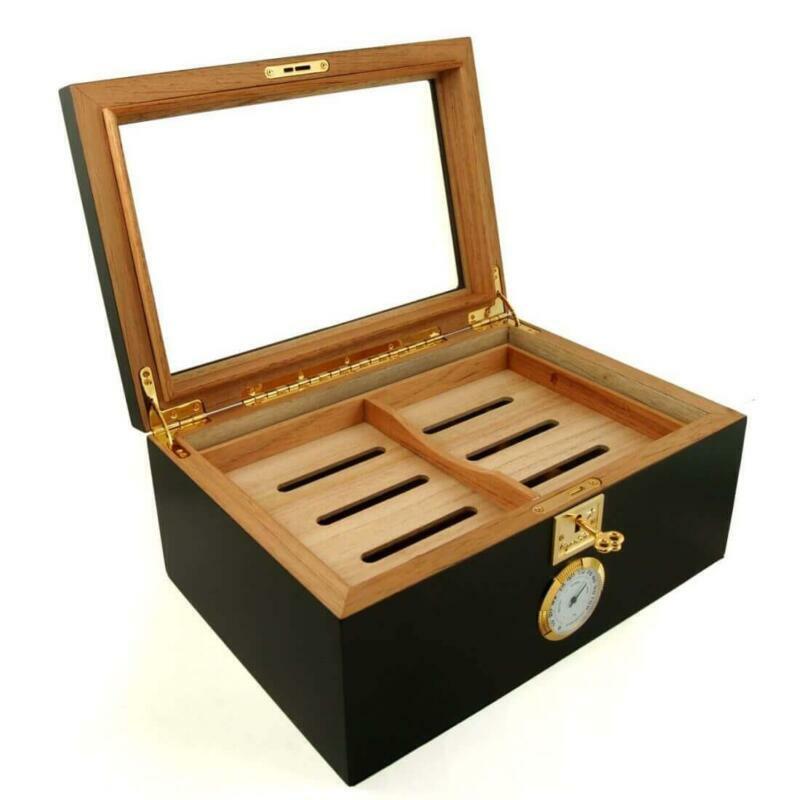 This beautiful Black Cigar humidor Will showcase your cigars. Spanish cedar inlay inside and beautiful matte finish on the outside. Matt black in colour and is accented with a see through glass lid to showcase your fine cigars to others. Upgraded crystal bead humidifier, includes a Spanish cedar air flow rack on the bottom. 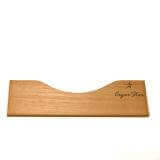 Hygrometer placed outside on front of humidor for easy reading. 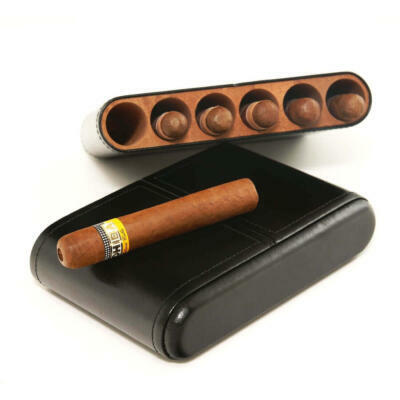 It will store up to 125 cigars. Includes brass hardware throughout including brass key and lock to keep your cigars safe. 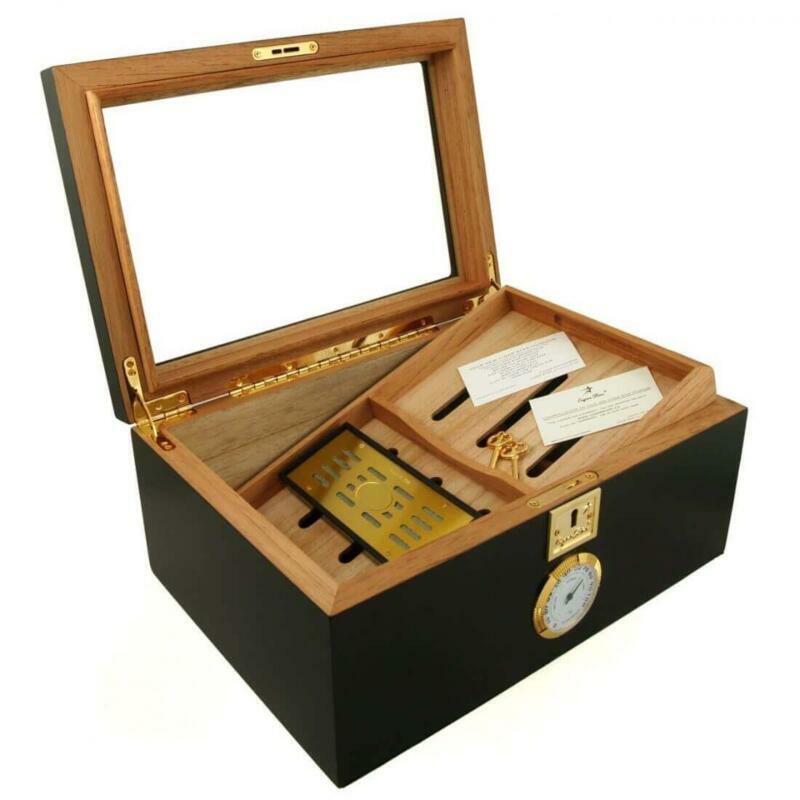 The humidor has a perfect seal and is top quality. 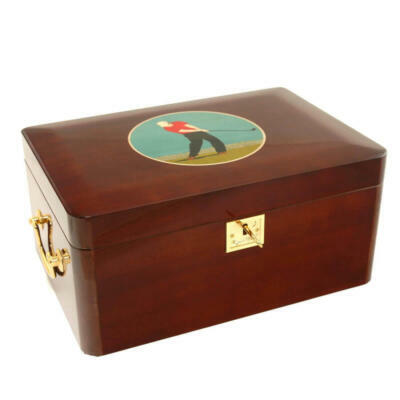 Will keep your cigars as fresh as the day you put them in. 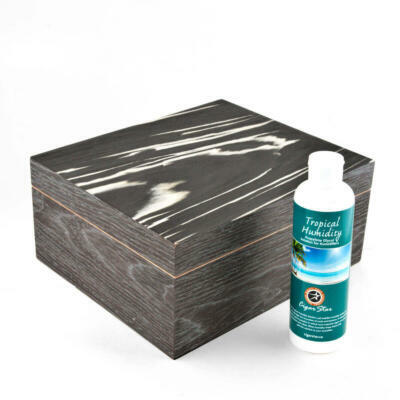 Allows for perfect aging & superb taste for your tobacco. 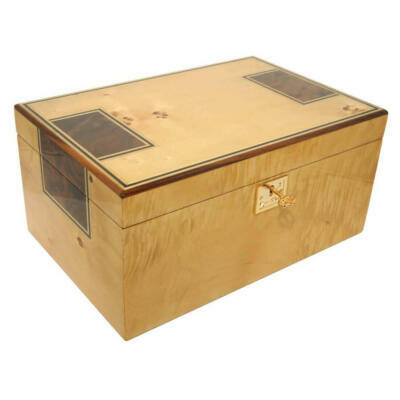 This humidor will bring a touch of class and will be a focal point in any room you put it in due to its unique style and finish. 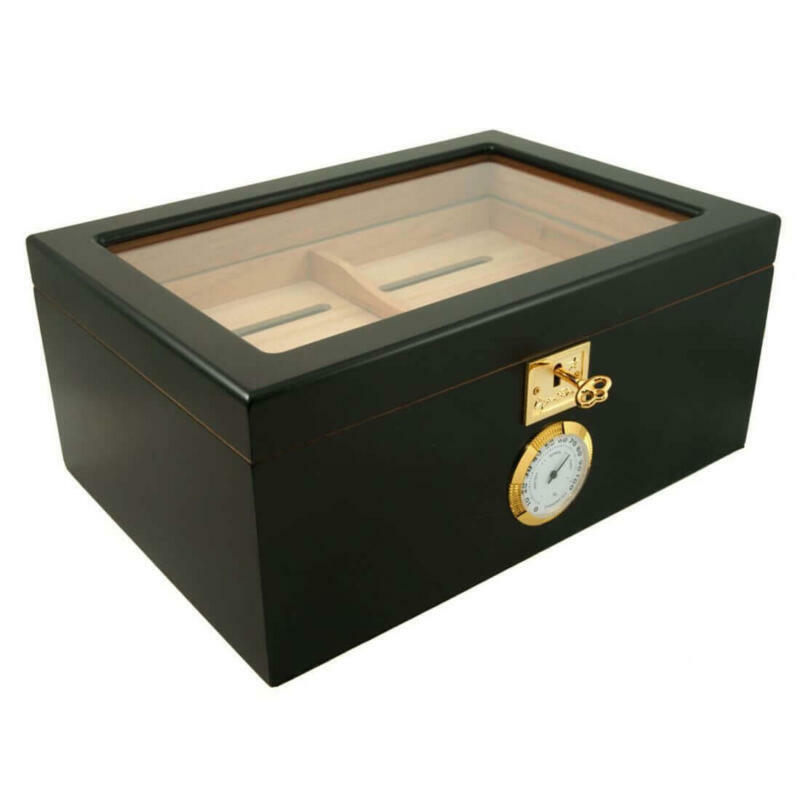 Matt Black cigar humidor finish. Brass hinges and hardware. INCLUDING PIANO HINGE IN THE REAR. Fully lined with premium kiln dried Spanish. 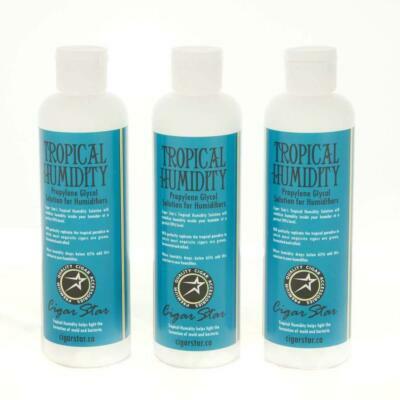 1 large easy-read hygrometer placed on outside. 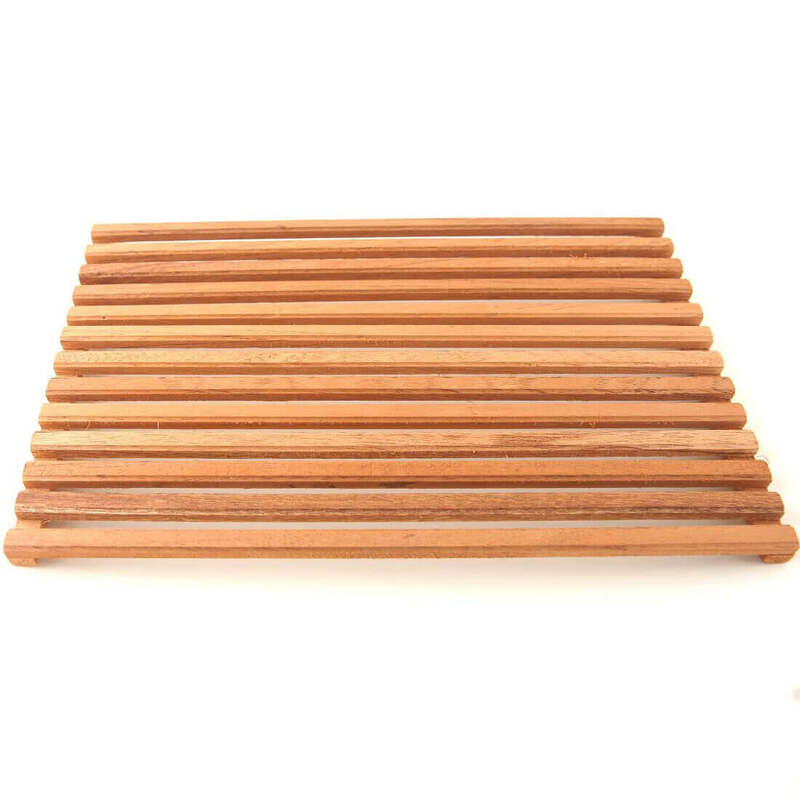 1 Spanish cedar air flow rack. 2 moveable Spanish cedar dividers. Felt on the bottom for scratch resistance. 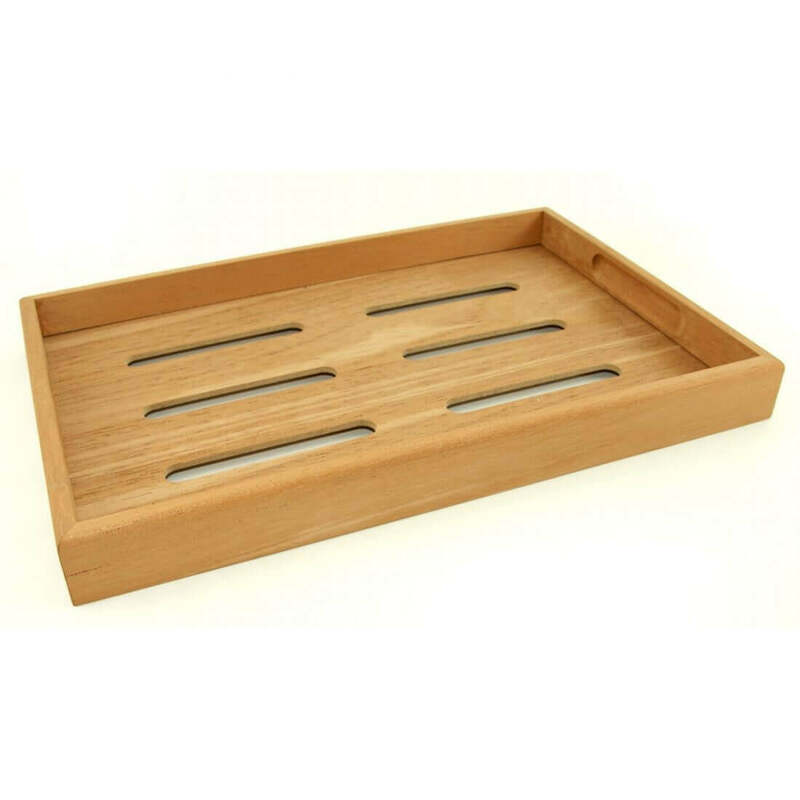 Window lid to showcase your cigars and removable Spanish cedar tray. Outstanding customer service! Thanks Linda! 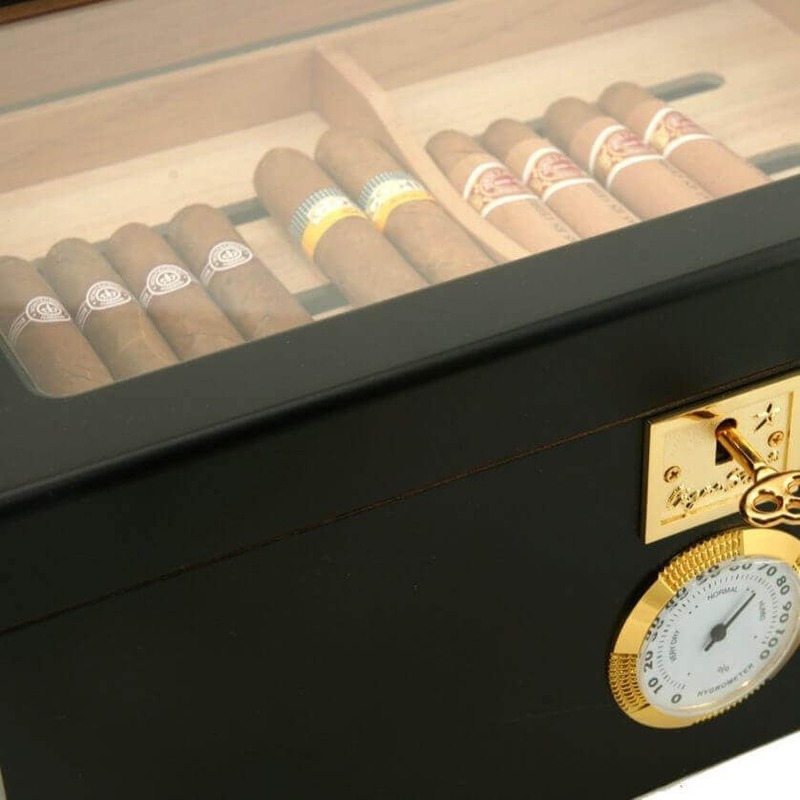 This cigar humidor is quality made. I was recommended to Cigar Star from a friend and they did not disappoint! 5* Fast shipping to! 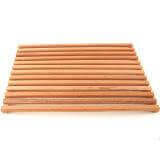 I am a beginner to the cigar world. I phoned in my order as I had a few questions, very helpful customer service. 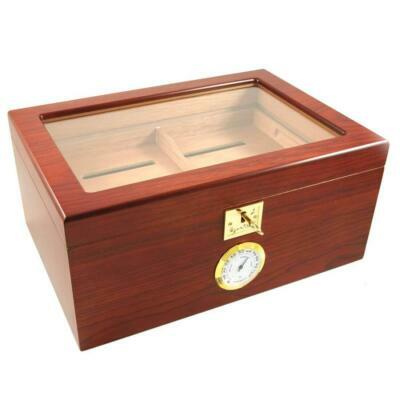 Seasoned the humidor once and it was 72%. 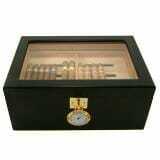 Have had the humidor for 3 months and my cigars are always fresh! Thanks for the great humidor and customer service!